"Las Vegas Army Airfield" redirects here. For the 1941-9 Las Vegas Bombing and Gunnery Range, see Nellis Air Force Bombing and Gunnery Range. For the 1956-70 radar site, see Las Vegas Air Force Station. The United States Air Force Warfare Center welcome sign with yellow bullseye symbol identifies the base as the "home of the fighter pilot". The Las Vegas Range of mountains to the Northeast (background) has Gass Peak. Nellis Air Force Base ("Nellis" colloq.) is a southern Nevada installation with military schools and more squadrons than any other USAF base. Nellis is the airbase for air combat exercises such as Red Flag and close air support exercises such as Green Flag-West flown in "Military Operations Area (MOA) airspace". associated with the nearby Nevada Test and Training Range (NTTR). The base also has the Combined Air and Space Operations Center-Nellis. Below a 4538th FWS F-4C, Nellis has "Great Basin mixed desert scrub and is in the Mojave Desert ecoregion near the ecotone with the Central Basin and Range ecoregion. The base's has desert precipitation levels of 4.3 in (110 mm) per annum..
Nellis AFB covers about 11,300 acres (4,600 ha) in the northeast corner of the Las Vegas Valley, an alluvial basin in the Basin and Range Province. Nellis has about 7,000 acres (2,800 ha) of undeveloped space; has areas added since WWII, e.g., Area II in 1969; and had 1 WWII runway removed. The base has 3 areas (I, II, III), and the GNIS names 5 different USGS locations for the base: "Nellis Air Force Base", the airfield, the post office, a Community College of Southern Nevada campus, and the census-designated place (CDP). 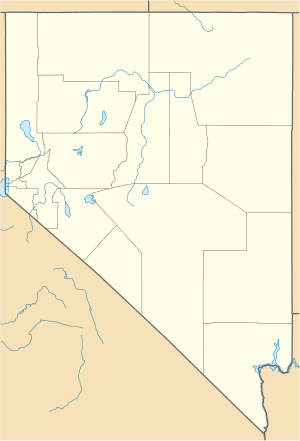 The Nellis Air Force Base CDP is a 3.1 sq mi (8.0 km2) region defined by the United States Census Bureau as of the 2010 United States Census. The CDP area includes military family housing (e.g., in Nellis Areas I & III), dormitories, and lodging as for aircrew temporary quarters during Red Flag exercises. The CDP residents include a portion of the Nellis work force of ~12,000 military and civilian personnel. As of the census of 2000, there were 8,896 people, 2,873 households, and 2,146 families residing in the CDP. Population density was 2,895.9 people per square mile (1,118.8/km²). There were 3,040 housing units at an average density of 989.6/sq mi (382.3/km²). The gender ratio was 4813 males to 4083 females (3290:2637 for those age 18 and over). The median age was 24 years, and distribution by age group was 33.4% under the age of 18, 19.7% from 18 to 24, 38.5% from 25 to 44, 7.1% from 45 to 64, and 1.2% who were 65 years of age or older. The racial makeup of the base was 68.5% White, 14.3% African American, 1.4% Native American, 5.0% Asian, 0.7% Pacific Islander, 4.9% from other races, and 5.2% from two or more races. Hispanic or Latino of any race were 11.7% of the population. There were 2,873 households out of which 52.6% had children under the age of 18 living with them, 61.5% were married couples living together, 7.7% had a female householder with no husband present, and 25.3% were non-families. Of all households 17.9% were made up of individuals and 1.1% had someone living alone who was 65 years of age or older. The average household size was 2.91 and the average family size was 3.36. 2000 census median incomes were $33,118 (household), $34,307 (family), $25,551 (male), & $19,210 (female); and per capita income was $13,601. About 10.0% of families and 11.1% of the population were below the poverty line, including 15.4% of those under age 18 and 16.1% of those age 65 or over. For the associated "Desert National Wildlife Refuge Complex" and "Tonopah Test Range Complex" identified by the 99th Air Base Wing, see Desert National Wildlife Refuge and Tonopah Test Range. "Nellis AFB complex" refers to a group of southern Nevada military areas that are predominantly USAF and Bureau of Land Management areas outside of the base (e.g., controlled by military units at Nellis). The complex's land areas include Nellis AFB, the USAF Nevada Test and Training Range, the active portion of the Small Arms Range Annex north of the base, the annex's Formerly Used Defense Site of 5,775 acres (2,337 ha) (cleared in March 1972, returned to the DoI), 13 BLM areas of 5.7 acres (2.3 ha) each leased for Patriot Radar/Communications Exercises, and other BLM sites "under Military Operations Area (MOA) airspace". Nellis AFB also leases space at the former Las Vegas AFS, and environmental sites of the Tonopah Bombing Range (FUDS) are monitored by the EPA. Additional Formerly Used Defense Sites associated with the area's military operations are the Nye County Areas A, G, H, & I; the "Delamar Dry Lake Test Annex" and the "Sunrise Mountain Machine Gun Range". WWII Nevada military sites included Army Airfields (red) such as Las Vegas AAF (airplane symbol) and Army/Navy ranges (black) such as Aerial Gunnery Range No. 4, Pyramid Torpedo Dropping Range, and the Lovelock Aerial Gunnery Range (yellow indicates Indian Springs auxiliary fields). For this base's eponym who was KIA in the 1944 European Theater of Operations, see 1st Lt William Nellis. After World War I, Nevada and other western inland states were surveyed by Capt. Lowell H. Smith and Sgt. William B. Whitefield for landing sites, and by "mid-1925 the Air Service possessed information on nearly thirty-five hundred landing places, including more than twenty-eight hundred emergency landing areas, in the United States." The 1929 airfield (dirt runway, water well, and small operations shack) north of Las Vegas—operated by the 1925 Western Air Express for Contract Air Mail (CAM) Route #4, LA-to-SLC—was used by the Army Air Corps in the 1930s for training flights (the 'WA' aircraft tailcodes reflect Western Air Express). After the Invasion of Poland in 1939, the "western site board" had located a southern Nevada area "near Tonopah, Nev" by April 1940 for a military range, and in October 1940, Air Corps Major David Schlatter surveyed the southwest United States for a military airfield. "The 60 x 90 mile area at Tonopah was transferred to the War Department on 29 October 1940" by Executive Order 8578. Not to be confused with the 1942 "Alamo Airport" south of Las Vegas and named for Senator McCarren in 1948. Renamed to McCarren Field in the mid-1930s, there were "difficulties in securing the use" of the airfield north of Las Vegas for a Nevada World War II Army Airfield.) McCarren Field was bought on 2 January 1941 by the City of Las Vegas, was leased to the Army on 5 January, and was "signed over" to the Quartermaster Corps on 25 January—Army construction began in March 1941.:2-1 The city's Federal Building became the May 1941 location of the 79th Air Base Group detachment (5 staff officers commanded by Lt. Col. Martinus Stenseth), and a month later 5 administrative NCOs plus other support personnel arrived. [not in citation given] WPA barracks in Las Vegas were used for enlisted men, and the motor pool with 6 vintage trucks and a semi-trailer was next to the WPA barracks. Vehicle parts were from local service stations and gasoline and oil from the Civilian Conservation Corps[where?] (the Block 16 brothels in Las Vegas were closed.) Permanent construction for barracks to house 3,000 people began in mid-1941, and by December 7, 10 AT-6 Texan advanced flight trainers and 17 Martin B-10 bombers were at the airfield. Not to be confused with Indian Springs AAF, its 4 auxiliary fields to the northwest, Tonopah AAF, or [[:Tonopah Bombing Rangedisambiguation needed]]. Las Vegas Army Airfield (Las Vegas Field colloq.) was both activated and began flying training on 20 December 1941, and gunnery training began in January 1942,:2–3 (guntruck platforms were used in January and February.) Many pieces of the destroyed aerial drone targets litter the hillside north of the gunnery range[which?] and can be seen in town when the sun reflects off of them. The 1st B-17 Flying Fortresses arrived in 1942 and allowed training of 600 gunnery students and 215 co-pilots from LVAAF every five weeks at the height of WWII, and more than 45,000 B-17 gunners were trained (USAAF training movie The Rear Gunner was filmed at the airfield in 1943.) The 82d Flying Training Wing for "Flexible Gunnery" was activated at the base as 1 of 10 AAF Flying Training Command wings on 23 August 1943:18 and by 1944, gunnery students fired from B-17, B-24 Liberator and B-40 Flying Fortress gunship aircraft (e.g., at aircraft-towed targets). In March 1945, the base switched to B-29 gunnery training which included the manipulation trainer[where?] on the ground with camera guns, and the subsequent population peaked with nearly 11,000 officers and enlisted personnel including more than 4,700 students. Flexible gunnery training ended in September 1945,:2–3 and the base became a demobilization center for soldiers' separation physicals and final pay. A course of navigator, bombardier, and radar operator training planned for LVAAF was instead begun at Mather Army Airfield in June 1946.:43 AAF Training Command closed LVAAF which went on caretaker status 28 August 1946 ("officially deactivated in January 1947"). :2–3 During the planning for a separate air force, the Las Vegas AAF was reactivated "30 Aug 47 as a subinstallation of Mather",:350 and it transferred to the USAF after[when?] the branch was created in September. Fighter Weapons School F-80As c. 1950 in front of tbd mountain (Frenchman’s Mountain is east of the valley.):3–6 . For the nearby Nellis Air Force Gunnery and Bombing Range named by December 18, 1950, see Nevada Test and Training Range. from Williams AFB. In early 1951, ATC assigned recently graduated airplane and engine mechanics to Nellis to learn jet aircraft maintenance. The airfield was expanded 1951-4 with longer jet-capable runways, reconfigured taxiways and a larger aircraft parking ramp; and WWII wooden structures were replaced with concrete and steel structures (e.g., barracks and base housing for married personnel). The first Wherry houses were completed in 1954, with updated Capehart houses being completed in February 1960. The USAF Fighter Weapons School was designated on 1 January 1954 from the squadron[verification needed] when the Air Crew School graduated its last Combat Crew Training Class (the primary Weapons School mission was gunnery instructor training.) In the mid-1950s for Operation Teapot nuclear testing, 1 of the 12 Zone Commanders was based at Nellis AFB for community liaison/public relations (weapons for other atomic tests were stored at Nellis). Air Training Command suspended training at the Nellis fighter weapons school in late 1956 because of the almost total failure[Clarification needed] of the F-86 Sabre aircraft used at Nellis, and during 1958 ATC discontinued its Flying Training and Technical Training. Nellis AFB transferred to Tactical Air Command on 1 February 1958, and the Nellis mission transitioned from initial aircraft qualification and gunnery training to advanced, graduate-level weapons training. Soon after the transfer to TAC, the F-100C and F-100D entered the school inventory. The 3585th wing assets were redesignated as the 4520th Combat Crew Training Group by TAC on 1 Jul 1958. The 4520th Combat Crew Training Wing was designated fom the 4520the CCTG on 1 May 1961), and the Combat Crew training squadrons were renumbered. The 4537th Fighter Weapons Squadron had been assigned F-105D Thunderchiefs in March 1961, and the wing taught veteran pilots in all phases of fighter weapon employment: air-to-air gunnery, rocketry, conventional and nuclear bombing, aeria1 refueling, and combat navigation. The F-4 Phantom II Instructor Course began in mid-1965 and during the Vietnam War, experienced combat pilots were used as Fighter Weapons instructors at Nellis. On 1 January 1966 the USAF Fighter Weapons School was activated at Nellis with F-100, F-4, and F-105 divisions and on 1 September 1966, Fighter Weapons School elements and the 4520th CCTW merged to activate the 4525th Fighter Weapons Wing. The Nellis control tower behind a 4536th F-100D ("WB" tail code). In July 1968 the first tail codes appeared on Nellis-based aircraft: "WC" (4537th F-105), "WD" (4538th F-4C), & "WF" (4539th F-111). The USAF Tactical Fighter Weapons Center activated at Nellis AFB on 1 January 1966 (USAF Warfare Center after 15 Nov 2005) is the USAF authority for employment of tactical fighter weapons. The center has developed, refined, coordinated, validated and tested fighter concepts, doctrine, tactics, and procedures. The FWC also performed operational test and evaluation and prepared or monitored Air Force publications on employment tactics, aircrew training, and aircrew weapons delivery. It has supervised courses of the US Air Force Fighter Weapons School, adversary tactics training, and Wild Weasel training, and other combat and tactical schools. The FWC supervised Red Flag operational training and other continuing air exercises, such as Green Flag and Silver Flag Alpha. The center also directed operations of the US Air Force Bomber and Tanker, Employment School since 1992 and the Air Rescue Center since 1993. The USAF Air Demonstration Squadron with the United States Air Force Thunderbirds moved from Arizona to Nellis AFB in June 1956. The 474th Tactical Fighter Wing was reassigned from New Mexico to Nellis AFB on 20 January 1968 and was the first USAF operational wing equipped with the General Dynamics F-111—6 of the F-111As departed Nellis for Vietnam on 15 March 1968 (Combat Lancer). Nellis provided replacements for 2 lost F-111s, and the F-111s returned to the USA[where?] in November 1968. The wing's 428th Tactical Fighter Squadron reached IOC in spring 1968 with F-111s, and the TFW was fully operational in July 1971. The Lake Mead Base, a 1953-6 United States Navy's weapons storage area of 6,999 acres (2,832 ha), became Area II of the Nellis AFB complex in September 1969. The 430th TFS returned to the 474th TFW Nellis on 22 March 1973 assuming a replacement training unit mission, while the 428th and 429th were transferred to Mountain Home AFB on 30 July 1973. Post-war the 474th's mission was to train combat-ready force of aircrews and maintained a rapid-reaction capability to execute fighter attacks against enemy forces and facilities in time of crisis. In 1975, the 428th and 429th Tactical Fighter Squadrons were reassigned to the wing with F-111As (transferred to Mountain Home AFB, Idaho, in August 1977) and the 474th Wing absorbed the F-4D Phantom II aircraft, crews, and resources of the inactivating provisional 4474th Tactical Fighter Wing at Nellis in April 1977. The wing was inactivated in September 1989, and its F-16As transferred to Air National Guard and Air Force Reserve squadrons. The Las Vegas Range of mountains is visible beyond a 66th FWS F-4E on the Nellis tarmac. The 57th Fighter Weapons Wing was activated at Nellis on 15 October 1969 to replace the 4525th FWW (its Fighter Weapons Squadrons transferred to the 57th). The USAF Air Demonstration Squadron (the "Thunderbirds") was assigned to the 57th in February 1974, and the wing incorporated intelligence training after March 1980. Redesignated the 57th Tactical Training Wing in 1977, the wing trained tactical fighter aircrews, conducted operational tests and evaluations, demonstrated tactical fighter weapon systems, and developed fighter tactics. The 57th's 4440th Tactical Fighter Training Group (Red Flag) assumed operational control of Red Flag exercises in October 1979; and the 57th developing realistic combat training operations featuring adversary tactics, dissimilar air combat training, and electronic warfare. The Las Vegas Strip is visible from the Nellis tarmac with an F-16C. Operation Ready Switch replaced Nellis' F-4s when the 474th was the 3rd USAF wing to receive F-16s (November 1980). The USAF Fighter Weapons School reactivated 30 December 1981 in the 57th wing and the 66th, 414th and 433d Fighter Weapons Squadrons became its "A-10", "F-4E" and "F-15A" divisions (the 414th was the "Red Flag Training Squadron" in 1996). :205 The 422d FWS aircraft and personnel became the "F-16 Division" and the squadron heraldry transferred to the 422d Test and Evaluation Squadron. The FWS mission expanded on 15 June 1993 to include all Air Combat Command weapons (B-52 & B-1 Divisions) and in 1995, rescue helicopters (HH-60 Division). RC-135 Rivet Joint and EC-130 Compass Call courses were also added to the CCO Division in 1995, as well as a Space Division in 1996 (UAVs in 2008). In 1981, the Gunsmoke gunnery meet was first held and the 57th Fighter Weapons Wing was reorganized as part of the establishment of the Fighter Weapons School, e.g., the 422d Test and Evaluation Squadron for aircraft modifications was established on 30 December 1981 from the 422d Fighter Weapons Squadron. Iin 1990, the 64th and 65th Tactical Fighter Training Aggressor Squadrons and the 4440th TFTG were inactivated in 1990 at the end of the Cold War. 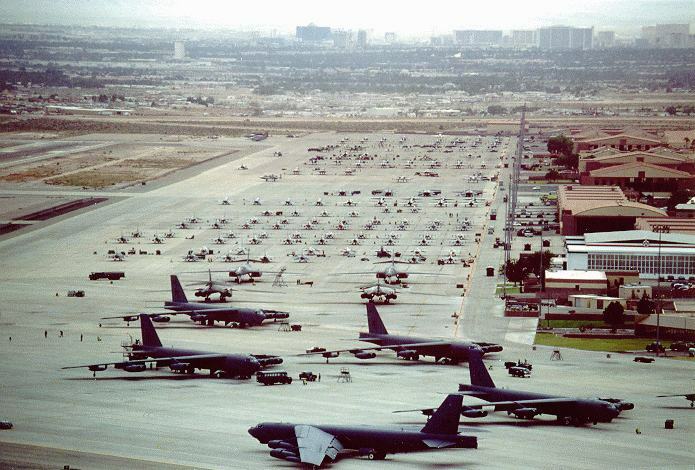 In November 1991, the 57th implemented the USAF Objective Wing organization which was the most comprehensive USAF reorganization plan since 1947, activating the 57th Operations Group for Nellis airfield operations and establishing the 57th Test Group. "Agressor" training was reactivated under the 57th Operations Group in 2003 and in 2006 Nellis had the Air Ground Operations School. :13 On 1 May 2007, the UAV reconnaissance elements assigned to the 57th Operations Group transferred to the 432nd Wing. Detachment 1 of the Space Warfare Center was established at Nellis in 1996 after the "Nellis Combined Air Operations Center", the Warfare Center transferred Nellis Air Force Range control to the 98th Range Wing in 2001, and the annual Aviation Nation airshow began at Nellis in 2002. The Nellis Solar Power Plant constructed 23 April 2007-December 2007 on Nellis' west side was visited by president Barack Obama on 27 May 2009. In 2010, the 505th Operations Squadron operated the Combined Air and Space Operations Center-Nellis. Wikimedia Commons has media related to Nellis Air Force Base. Nellis is mentioned in the 1996 film Independence Day, is also portrayed as the setting of Transformers, and the 2011 film Source Code associates with the Combined Air Operations Center-Nellis (CAOC-N). The base is a setting for games including the 2004 Grand Theft Auto: San Andreas and the 2010 Fallout: New Vegas, and Jane's USAF flight simulator features training missions that are done at Nellis AFB. ↑ 2.0 2.1 2.2 2.3 2.4 "Nellis Air Force Base, Nevada". The Military Standard - Air Force Bases. TechBastard.com. http://www.techbastard.com/afb/nv/nellis.php. Retrieved 2013-06-06. ↑ 3.0 3.1 3.2 Huntley, Chris, Proj. Mgr. (August 2008) (Final Environmental Assessment). ﻿…Patriot Communications Exercises in Lincoln County, Nevada﻿ (Report). AFD-081006-078. Aspen Environmental Group. pp. 3–28. http://www.nellis.af.mil/shared/media/document/AFD-080404-038.pdf. Retrieved 2013-02-06. ↑ 5.00 5.01 5.02 5.03 5.04 5.05 5.06 5.07 5.08 5.09 5.10 5.11 "Nellis AFB Factsheet". 57th Wing/PA. http://www.nellis.af.mil/units/index.asp. Retrieved date tbd. ↑ "Nellis Based Exercises". DreamLandResort.com. http://www.dreamlandresort.com/info/nellisranges.htm. ↑ 7.00 7.01 7.02 7.03 7.04 7.05 7.06 7.07 7.08 7.09 7.10 7.11 7.12 7.13 ﻿Comprehensive Site Evaluation Phase II﻿ (Report). June 2010--draft "Rev.02". http://www.nellis.af.mil/shared/media/document/AFD-100621-030.pdf. Retrieved 2013-06-08. "In September 1969, Area II became part of the Nellis AFB complex. Previously, it was named Lake Mead Base and served as a weapons storage area for the U.S. Navy. … the RP-63 Pinball, which was sufficiently armored to be fired upon using frangible bullets. The Las Vegas Valley (the Valley) is a bowl-shaped basin surrounded by rugged mountain ranges. The entire hydrographic basin is 1,600 square miles. The western edge of the Valley is approximately 5 miles west of Lake Mead, which is an impoundment on the Colorado River. The Valley occupies a structural basin in the Basin and Range Province of the northern Mojave Desert, and most shallow groundwater and all surface flows are transported to Lake Mead via the Las Vegas Wash."
↑ 8.0 8.1 8.2 8.3 8.4 Rininger, Tyson V. (2006). "History of Nellis Air Force Base". http://books.google.com/books?id=lAlIaNJMlgkC&pg=PA9&lpg=PA9&dq=%22Martinus+Stenseth%22+%22las+vegas%22&source=bl&ots=6ZQPEvpw8L&sig=MS0SManWH4xON6J8jxE43b4ntac&hl=en&sa=X&ei=wAK2UYjbGqvKywH6gIGgDQ&ved=0CEgQ6AEwBg#v=onepage&q=%22Martinus%20Stenseth%22%20%22las%20vegas%22&f=false. Retrieved 2013-06-10. ↑ "Nellis AFB, NV". GlobalSecurity.org. http://www.globalsecurity.org/military/facility/nellis.htm. Retrieved 2013-06-06. ↑ 11.0 11.1 Knapp, George (7 November 2008). "I-Team: The Road Warriors, Part 2". http://www.lasvegasnow.com/global/story.asp?s=9315164. Retrieved 2008-11-10. ↑ 12.0 12.1 "Profile of General Population and Housing Characteristics: 2010 Demographic Profile Data (DP-1): Nellis AFB CDP, Nevada". U.S. Census Bureau, American Factfinder. http://factfinder2.census.gov. Retrieved 13 March 2012. ↑ "Census of Population and Housing (1790–2000)". U.S. Census Bureau. http://www.census.gov/prod/www/abs/decennial/index.html. Retrieved 2010-07-25. ↑ "List of [FUDS] Sites…" (sorted database query list). CorpsFUDS.org. http://corpsfuds.org/php/list.php?type=sites&find=exvqzcto&county=. Retrieved 2013-06-10. ↑ ﻿Archive Search Report: Dixie Valley Bombing Target No. 21﻿ (Report). "World War II Navy pilots at Fallon AAS also used ranges at Black Rock, Sahwave, Lovelock Gunnery Range, Pyramid Lake (torpedo bombing range) and Bravo 19 [in the Blow Sand Mountains"
↑ Maurer, Maurer. ﻿Aviation in the US Army, 1919-1939﻿ (Report). ISBN 0-912799-38-2. ↑ 21.0 21.1 21.2 Futrell, Robert F. (July 1947). ﻿Development of AAF Base Facilities in the United States: 1939-1945﻿ (Report). ARS-69: US Air Force Historical Study No 69 (Copy No. 2). Air Historical Office. "Difficulties in securing the use of the gunnery ranges at Las Vegas, Nev., and Tyndall Field, Fla., delayed the beginning of flexible gunnery training at those stations until December 1941"
↑ ﻿Final Inventory Project Report, Tonopah Bombing Range﻿ (Report). Project Number - J09NV1114. USACE Sacramento District. September 1999. "Executive order 8578 was executed on October 29, 1940 for the withdrawal of 3,560,000 million acres (1.44×1010 km2) of land from the public domain for use by the War Department as an aerial bombing and gmnery range (CE0769)." ↑ "Las Vegas' Past". NetPhilosophy.Com. http://www.lasvegas2005.com/past/index.asp?Anno=19. Retrieved 2008-11-08. ↑ 24.0 24.1 24.2 24.3 24.4 Manning, Thomas A (2005). "Installations". History of Air Education and Training Command, 1942–2002. pp. 42-tbd. http://archive.org/stream/historyofaireduc00gop/historyofaireduc00gop_djvu.txt. Retrieved 2013-06-09. "INSTALLATIONS Las Vegas Field, Nevada Air Training Command inactivated the base on 31 December 1946. From its activation on 20 December 1941, Las Vegas AAF had conducted flying training." ↑ "The Rear Gunner". Internet Movie Data Base. http://www.imdb.com/title/tt0036293. ↑ 26.00 26.01 26.02 26.03 26.04 26.05 26.06 26.07 26.08 26.09 26.10 Manning, Thomas A (2005) (Report in Archive.org text format). History of Air Education and Training Command, 1942–2002. AETC Office of History and Research. ASIN B000NYX3PC. http://archive.org/stream/historyofaireduc00gop/historyofaireduc00gop_djvu.txt. Retrieved 2013-06-09. "Throughout 1944, B-29 gunners received practically the same training as those for other aircraft, but at the end of the year a few of them began to receive training in B-24s modified by the addition of central fire control turrets to make them more like B-29s. Then, as the year progressed, Buckingham Field, Florida; Las Vegas Field. Nevada; and Harlingen Field, Texas, all began offering B-29 gunnery instruction … Among the training devices used in this instruction was the manipulation trainer- 1 2 towers arranged to resemble a formation of planes. The towers ranged in height from 10 to 40 feet, each equipped with 2 nose. 2 tail. 2 ring sighting, and 4 blister positions. As students in these positions faced simulated attacks from PT-13 and PT-17 aircraft, they "fired" camera guns at the attacking fighters. … Two hurricanes, one in September and the other in October, destroyed Boca Raton Field in Florida [which] accelerated the move of the radar school to Keesler"
↑ 27.0 27.1 Manning, Thomas A (2005). "Appendix C". History of Air Education and Training Command, 1942–2002. pp. 350–60. http://archive.org/stream/historyofaireduc00gop/historyofaireduc00gop_djvu.txt. Retrieved 2013-06-09. "Activated as Las Vegas AAF 20 Dec 41. Conducted flying training until inactivated 31 Dec 46. Activated 30 Aug 47 as a subinstallation of Mather AFB. Assigned as a subinstallation of Williams AAF 1 Apr 48 to provide advanced training for fighter pilots. Redesignated Nellis AFB and activated 30 Apr 50. Conducted flying and combat crew training until transferred to Tactical Air Command 1 Jul 58." ↑ 28.00 28.01 28.02 28.03 28.04 28.05 28.06 28.07 28.08 28.09 28.10 Mueller, Robert (1989). ﻿Active Air Force Bases Within the United States of America on 17 September 1982: Nellis Air Force Base﻿ (Report). "Reference series". Volume I. Office of Air Force History. pp. 439–445. ISBN 0-912799-53-6. http://www.afhso.af.mil/shared/media/document/AFD-100921-026.pdf. Retrieved 2013-06-06. ↑ "Lieutenant William Harrell Nellis" (fact sheet). Nellis AFB Public Affairs. Posted 7/12/2012. http://www.nellis.af.mil/library/factsheets/factsheet.asp?id=4095. Retrieved 2013-06-10. ↑ Wilman, J. Catherene (1997). A Pictorial History of Nellis Air Force Base 1941–1996. Nellis AFB Office of History. http://books.google.com/books/about/A_Pictorial_History_of_Nellis_Air_Force.html?id=gcLkHAAACAAJ. ↑ 32.0 32.1 32.2 Martin, Patrick (1994). Tail Code: The Complete History of USAF Tactical Aircraft Tail Code Markings. Schiffer Military Aviation History. ISBN 0-88740-513-4. ↑ Davies, Steve (2008). Red Eagles. America's Secret MiGs. Osprey Publishing. ↑ "Constant Peg". April 2007. ↑ Winkler, David F; Webster, Julie L (June 1997). ﻿Searching the Skies: The Legacy of the United States Cold War Defense Radar Program﻿ (Report). Champaign, IL: U.S. Army Construction Engineering Research Laboratories. LCCN 9720912. http://www.dtic.mil/cgi-bin/GetTRDoc?Location=U2&doc=GetTRDoc.pdf&AD=ADA331231. Retrieved 2013-04-23. ↑ 37.0 37.1 Robertson, Patsy (Posted 8.19/2009). "USAF Weapons School (ACC)" (AFHRA fact sheet). http://www.afhra.af.mil/factsheets/factsheet.asp?id=15354. Retrieved 2013-06-10. ↑ 38.0 38.1 Rogers, Brian (2005). United States Air Force Unit Designations Since 1978. Hinkley, England: Midland Publications. ISBN 1-85780-197-0. ↑ Lambeth, Benjamin S.. Mastering the Ultimate High Ground: Next Steps in the Military Uses of Space. http://books.google.com/books?id=pfYaaQPHeb0C&pg=PA131&lpg=PA131&dq=combined+air+space+operations+center+nellis&source=bl&ots=5he2qBprPG&sig=rJ3B9vjhYrdTXZMFau0XzBK3C90&hl=en&sa=X&ei=Aq6wUYmAG-nOyQGelYDIDA&ved=0CGwQ6AEwCQ#v=onepage&q=combined%20air%20space%20operations%20center%20nellis&f=false. Retrieved 2013-06-06. ↑ "Combined Air and Space Operations Center-Nellis" (fact sheet). Public Affairs, 505th Command and Control Wing. Posted 3/3/2010. http://www.505ccw.acc.af.mil/library/factsheets/factsheet.asp?id=15313. Retrieved 2013-06-06. ↑ Kane, Robert B. (20 Jul 2010). "USAF Warfare Center (ACC)" (U.S. Air Force Fact Sheet). AFHRA. http://www.afhra.af.mil/factsheets/factsheet_print.asp?fsID=17241&page=1. Retrieved 2013-06-07. [dead link]"U.S Air Force AIM Points: Yes, those were MiGs flying over Nevada". Air Force Times. 14 November 2006. http://aimpoints.hq.af.mil/display.cfm?id=15031.